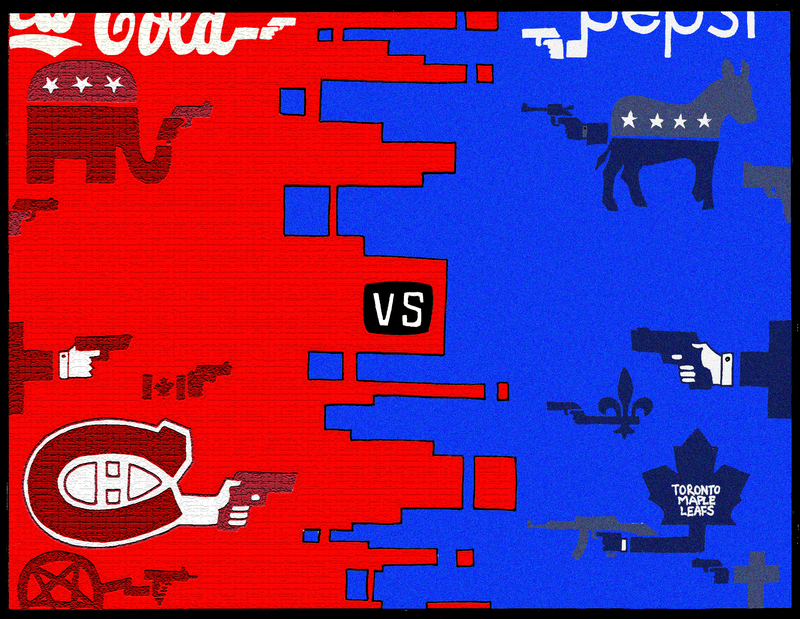 Coke versus Pepsi, Republicans vs Democrats, The Canadiens versus the Maple leafs. Color-based rivalries for a color-coded reality. We’re simple people, and we like our confrontations to have as much complexity as a kindergarten color chart. And the people selling us the conflict understand that, they understand the power of color on the subconscious. The opposing political party are so profoundly wrong, they makes us red with anger. That other commercial brand is so lame, it makes us blue in the face. The psychology of color takes on a completely different angle when you apply it to politics and aggressive marketing. The Green party has a green logo. That makes sense. But considering that red is the official color of communists and liberals, then why are the Republicans associated with red? Turns out it’s just a coincidence. Apparently RED and BLUE were assigned alternatively between Democrats and Republicans each election by the media. But after the controversy of the 2000 George W. Bush election, where each district was fought tooth and nail between a red force and a blue force, well, each color stuck. And that’s how the Republican party ended up with the official color of liberals and communists. I remember my high school history teacher telling us that back in the day, when Quebec was still ruled like a theological monarchy, that before every election, the clergy would advise their parishioners on how to vote with the following statement: ” Heaven is blue, and Hell is red, makes sure you vote wisely”! That was referring to the socially progressive Liberal party and their red logo, as well as to the church-supporting Union National and their blue logo. There’s nothing like having the catholic church spell it out for us kindergarten educated electoral simpletons, using simple color-coded analogies. And then people wonder why Quebecers curse at the Catholic church so much. And ultimately, if you look at it, why is it always Red vs Blue? Why not Brown vs Purple? Turquoise vs Canary Yellow? And apart from the fact that those might clash, I would venture to say that the main reason for RED and BLUE to always be picked for rivalries, is because, on average BLUE is always everybody’s favorite color. The sky is blue, the ocean is blue, what’s not to like? And RED is the color that will always “pop out” the most. Unless you put it next to some pink, but then again, pink is just some “light red” if you get down to it. NATNOTE : Any similarities to existing brands and their trademarked logos, is a coincidence, unless used specifically for satirical purposes.